Upon reading yesterday’s column, in which I suggested that the Spy within, our house guest, Charley The Spy, has found a way of avoiding a clash on the golf course, pleading gout, he was so overcome with shame that he suggested that he may be able to endure 9 holes. Modesty forbids me to record the exact scale of the defeat he suffered or indeed the outcome but the more perceptive of my readers will have worked out the result. There as an old golfing expression which alludes to the humiliation on this scale; “a dog licence” which in old money (as opposed to the new money in which Currencies Direct deal for all your foreign exchange needs) was 7 and 6. For non golfers it a means that a you have won by six holes with seven to play, which is a thrashing. The margin yesterday was merely 4 and 3, which, over 9 holes represents a defeat on a similar scale. I have a picture of him below, which just goes to show that check should never been worn with stripes. The Spy attired in check with stripes? no, no, and no. During our round we began discussing cars and what we would like to own. My personal choice would be a Bentley Azure, the last great shape made by this marque before it went all football wives on us. Charley the Spy wanted, quite predictably when you think about it, a Spyder, made by Alfa Romeo, which are lovely looking cars but break down all the time. As day follows night, golf was followed by lunch where the great exploits of one of the players, and the woes of the other were discussed and there was the ritual handing over of the wager of the customary 10 euro note, which I may or may not have been sporting stuck on my forehead before we ate. There are often some interesting culinary delights on the fixed menu of Auberge St Donat and yesterday one of the courses was, I think, tongue in mushrooms, and was delicious. This led to a discussion about the most exotic foods any of us has consumed. As they probably have never said; the Spy has it. Well, the son of the Spy who, when in Japan, as a special treat one New Years Eve, ordered his father some Fish sperm. A diversion after lunch to see Roly and Poly’s new pav was the start of the descent into the wonderful abyss of alcoholic gratification. The Master Mariner Mundell hoved into view in early evening, dropped anchor and settled into my stock of rosé and after that things became a bit hazy. I do have a note on my phone about William of Orange lacking appeal, but cannot recall in which context this was said. I do recall the Master Mariner asking Charley the Spy what he did for a living. It is the only time I have ever seen the Master glaze over as he listened to the interminable description of his cover, and, like many before him, came to the obviously spooky conclusion. 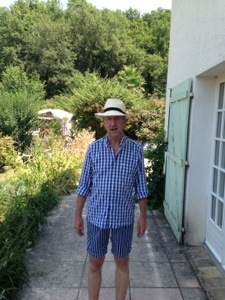 With the Spy off today on a new assignment elsewhere in Provence, my attention this morning will turn to tennis. A match has been arranged for later this morning between a successful author (who sold two more copies if his book The Valbonne Monologues yesterday), the Wingco, Mr Clipboard (who has a brief exeat from his family duties) and Loudmouth Largy. The usual rules apply. When I win in whatever partnership I am placed, there will be loud trumpeting of this sporting feat, should there be an unseen reverse in fortunes than I fear the pressure of space in this column may consign any coverage of that outcome to the cutting room floor. No wonder you always claim victory if you think you’ve won when you are six up with seven to play…….!! Errr… 7 and 6, seven up with six to play?